Recently, I was in Indiana presenting about teaching Science Technology Engineering Arts Math (STEAM/STEM) in ways that engage digital learners. General Electric is setting the example by engaging learners with science through Vine, Snapchat, and Tumblr. They have created 2 hashtag movements to help millions become inspired by science and conduct their own science experiments and share them. The first movement encourages people to record a six second Vine video of a science experiment or phenomena then post on Tumblr, Twitter, Vine with the #6SecondScience hashtag. For the most recent movement, GE teamed up with Bill Nye to create the Period Table of Emoji Science Videos. When an emoji is snapped to Bill Nye he shares a short science video explaining a science theory with emoji. I’ve shared my favorite one on superhero powers below. Others are encouraged to create their own #EmojiScience videos and share them on social media with the hashtag #EmojiScience. I share some of my ideas and resources for engaging learners in digital ways in the slideshow (free to download) and bookmarks below. 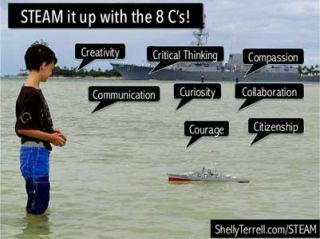 Don’t forget to check out my recent post about my keynote at ICEIndiana, Byte-sized Potential and Learning with the 8 C’s. Engage learners through any of these instructional practices- visual aids, screencasts, hands-on learning, sensory learning, TPR- total physical response, graphic organizers, role-plays, visual aids, realia, flashcards, pair work/group work, storytelling, diagrams, foldables, gamification, flipped learning, labeling, magic, games, problem/project based learning, drama, finger plays, QR codes, mindmapping and notetaking. Use QR Codes!Students can scan the QR Code Periodic Table of Elements and find videos for each element.Assign students a different part of something needing to be labeled, such as the human skeleton, and create QR codes their peers scan and learn! Teach with comics! My favorite comic creators are Pixton (Web/iOS/Android), Makebeliefs, ToonDoon, Friendstrip and Comics Head. Find more here!There are comic books showcasing elements as shown in the Periodic Table of Comic Books for Elements. Bunpei Yorifuji’s children’s book, The Wonderful Life with the Elements illustrates each element as a cartoon as well as Elements by drawn by Kacie D.Get students to create word problems in comic form! Find many examples here, Rothinks.wordpress.com! Get students to take word problems from the book and express them in emoji form for their peers to solve. Play I Spy which is in my book Learning to Go! Students take close-up images representing geometric shapes, fractions, etc. Skype or Google Hangout with a guest expert. Here are many resources for Google HangOuts. Try Skype Education to find guest experts. Have students conduct field research and document their observations in a log! These free apps are my favorite for keeping ongoing observation journals- ProjectNoah.org (iOS/Android), Zydeco Inquiry (iOS), BioKIDS (iOS), and Evernote (Web/iOS/Android). Discover more research apps here! Students can conduct experiments. Use GE’s #EmojiScience and #6SecondScience videos to inspire them. Try creating makerspaces. Kim Brand (@1stMakerSpace) has offered to help any school set up a makerspace for free. Find more resources searching the hashtag #makereducation. Get them to use a 3D printer. Find resources using these hashtags- #3DPrinting, #3D, #3DPrint, #3Dprinter, and #3Dprinted. Get them coding. Code.org has plenty of free lesson plans and training for teachers all over the US. Get students to join the Hour of Code event taking place in over 100 countries from Dec. 7 to 13th. Students can try to survive a Zombie apocalypse! Try STEM Hollywood lesson plans, this 2nd/3rd grade lesson, or this one for English Language Learners. Get students to visualize their data and research by creating infographics with these free web tools and apps- Piktochart, Easely, Visme, Smores, EduBuncee, Canva, Tackk, or Biteslides. Get them to brainstorm through sketchnoting and mindmapping! Find plenty of mindmapping and notetaking tools and tips here! Use graphic organizers! Find plenty of graphic organizer tools and tips here! Get students to bookmark their research with these free tools and apps- Diigo, Pearltrees, Storify, Pinterest, Livebinders, and Educlipper. Find more resources here! Learn through cooking! Find science recipes here. Play mobile games that teach math and science like Solve the Outbreak (iOS/Android), Math vs Zombies (iOS/Android), Monster Physics (iOS), and Zombie Physics (iOS). Students can create games for their friends to play!Try Hopscotch (students learn coding), TinyTap(iOS/Android), or Scratch MIT. Click any of the boxes to visit the resource!